Typical English Cafe menu and lots of it. Chips come with almost anything. All day breakfast with 5 choices + toast + coffee/tea was a really good deal. Family run and very casual. Just what we wanted. Franks is near Oxford Circus - they make excellent, fresh, sandwiches at very reasonable prices. Really worth a detour to get such a lovely sandwich at lunch time. Traditional, Big Portions, Everything I Hoped For! We had our Airbnb located just across the street and decided to give this little cafe a try for breakfast! 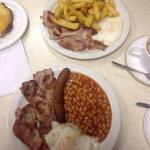 The staff was excellent and very friendly, the food was the traditional typical English breakfast in big portions! You will definitely get your fill for breakfast and you will also get that local feel of a English diner which was also reasonably priced. Our vegetarian friend also was happy, so it comes recommended from a meat eater like me and my healthy vegetarian buddy. Check it out! Been to Franks Cafe? Share your experiences!